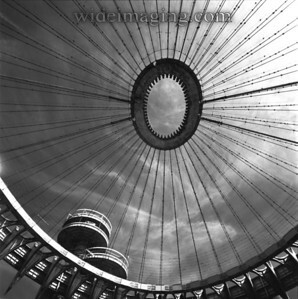 Interior view of New York State Pavilion, taken on June 29, 2007. 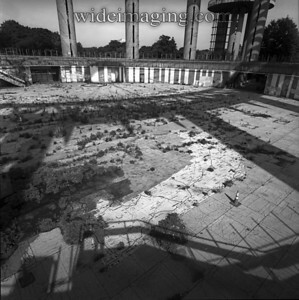 I had to sneek in to take these shots as the entire pavilion has been fenced off and in such a state of disrepair that it is deemed unsafe for the general public. 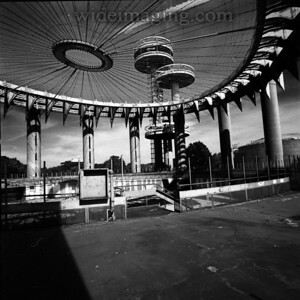 New York State Pavilion taken on June 29, 2007. The tragedy of the New York State map. The map was designed with 567 terrazzo mosaic panels, each weighing 400 pounds. Rand McNally & Company assisted in constructing the $1,000,000 map, which featured the 50,000 square miles of New York State in meticulous detail. 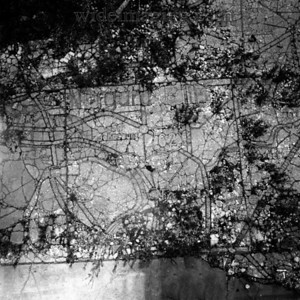 The cities, towns, highways, roads, and Texaco stations were accurately mapped in the 9,000 square-foot design. 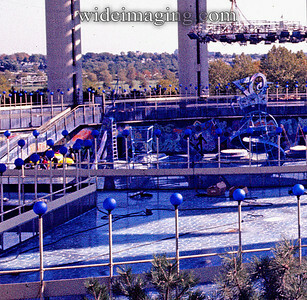 One of two fountains in front of the New York City Pavilion, taken on June 29, 2007, North East corner. 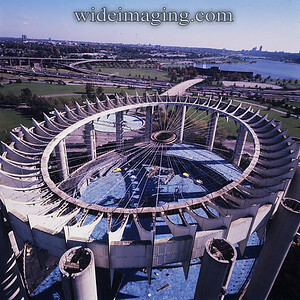 350' at the widest span, this is still one of the world's largest prestressed cable suspension roofs. The colored roof panels are gone, but fortunately the rest was designed to last. Fenced off entrance to the crumbling New York State terrazo floor map. 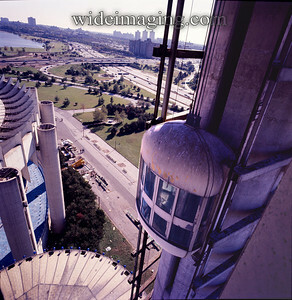 View from the mezanine looking toward the towers. 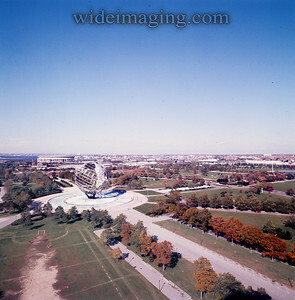 To the right is the Queens Theatre in the Park under construction, from June 29, 2007. New York State Pavilion taken on June 29, 2007. 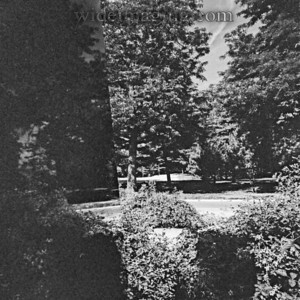 The pavilion was donated to the City after the World's Fair. 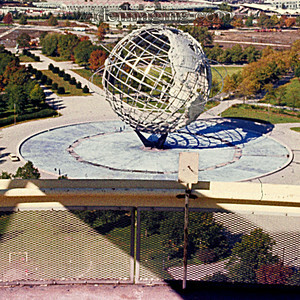 Like the Unisphere this dramatic structure has become an icon of Queens, visible from a distance on the Grand Central Parkway and Long Island Expressway. 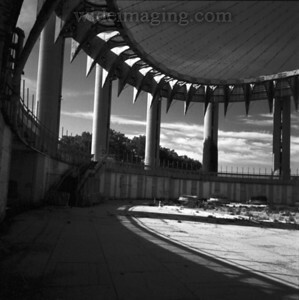 Philip Johnson's masterpiece survives despite over 42 years of neglect. 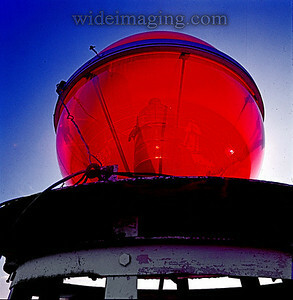 You've seen it photographed a thousand times but it still captures your imagination. June 29, 2007. 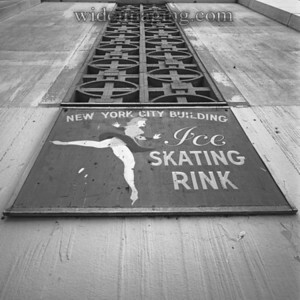 Ice skating rink sign on the former New York City Pavilion, from July 2001. New York State Pavilion taken on June 29, 2007. 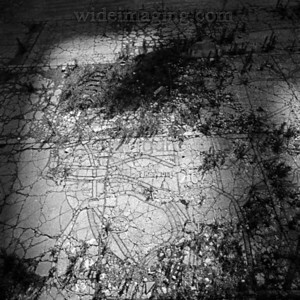 Disintegrating Texaco Map Western New York State, Niagra Falls area. 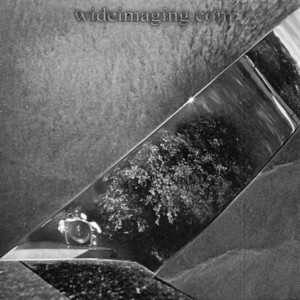 View looking up at the reflective surface of Jose de Rivera's sculpture: "Free Form", with sky background. 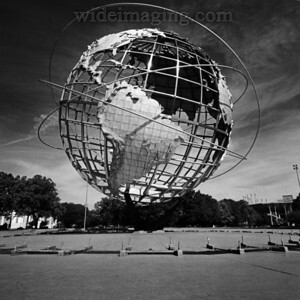 From Flushing Meadow Park, June 29, 2007. 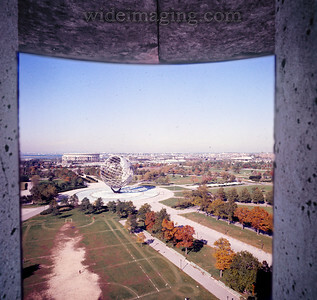 Granite base of Jose de Rivera's free form sculpture reflects Flushing Meadows. During the Fair, if you put your ear up to the base you could hear the motor that would slowly rotate the stainless steel sculpture, June 29, 2007. 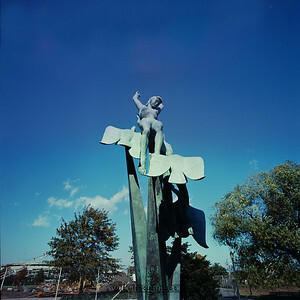 View under Marshall Fredricks' "Freedom of the Human Spirit" sculpture, from October 15, 1977. 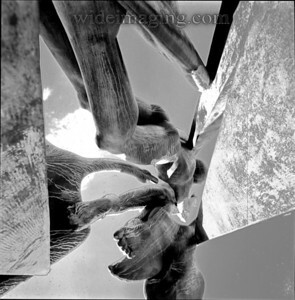 Marshall Fredricks' "Freedom of the Human Spirit", 24ft bronze sculpture. 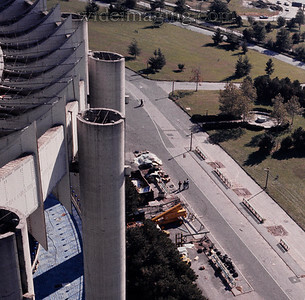 In the backround is the rubble from the demolition of the United States Pavilion. 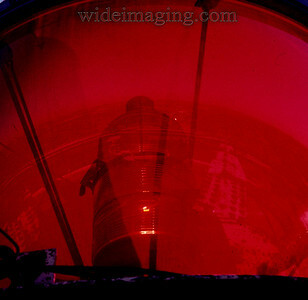 The aviation warning light atop the New York State Pavilion, October 15, 1977. When the light needs to be replaced a specialist has to rappel the 250' structure since the interior triangular landing and stair system was allowed to corroded away. 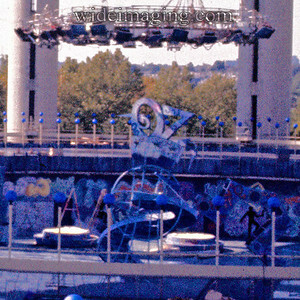 View, near the tower elevators, looking at the disassembly of the WIZ set, filmed under the Tent of Tomorrow. October 15, 1977. 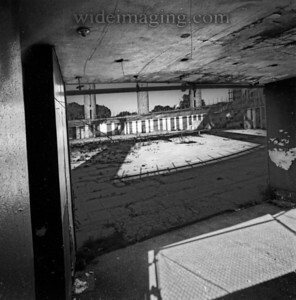 View looking North from the second tower stairway. 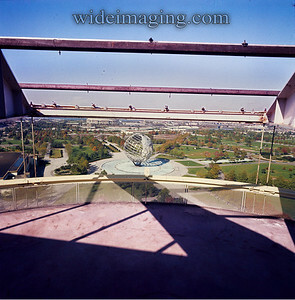 View looking North-East from top observation deck, 232'-3" New York State Pavilion main tower, October 15, 1977. 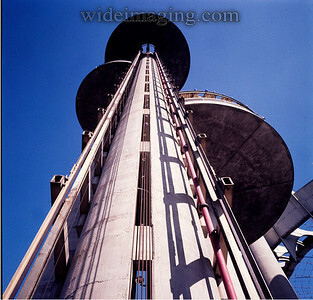 Detail from http://SWC-Biogon.smugmug.com/photos/191476488_Gu8VY-L-3.jpg Top observation platform of the NYSP main tower, 10/15/77. 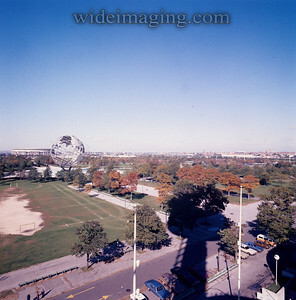 New York State Pavilion by October 15 1977 a shadow of it's former self. 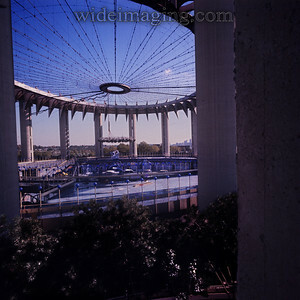 View looking North, toward Shea Stadium, from the top deck. 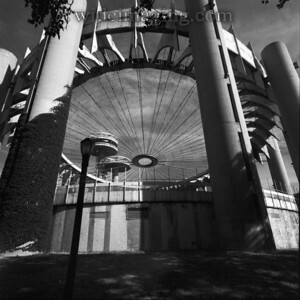 New York State Pavilion from October 15, 1977. 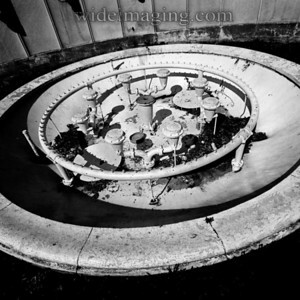 In the center you can see OZ and other props, see detail in this gallery. An extreme blow-up shows the OZ of WIZ, October 15, 1977. I didn't realize it at the time but this detail from http://SWC-Biogon.smugmug.com/photos/191494492_f6Bgc-L-2.jpg shows the "OZ" prop, scene graffiti and the set crew moving a taxi prop. It wasn't until years later, when I picked up a DVD of the WIZ that I took a closer look. October 15, 1977. 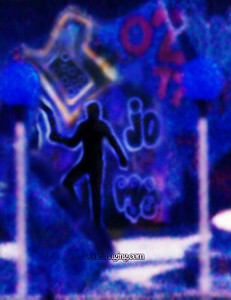 Detail shows one of the WIZ graffiti characters from which a real actor would emerge during the film.